Diesel-powered towboats on the nation’s inland waterways spew some of the dirtiest exhaust emissions, but an experiment on a vessel docked in the Monongahela River eventually could help clear Pittsburgh’s air. 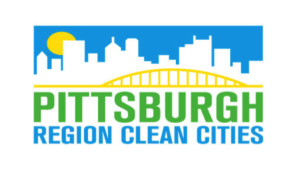 Pittsburgh Region Clean Cities, a local nonprofit that’s part of the U.S. Department of Energy Clean Cities program, is leading the project, which will use natural gas to power the Principio, a towboat that has been pushing barges on the three rivers since the 1940s. It is currently docked in Braddock. The retrofit of the towboat, one of three operated by Gulf Materials LLC, will cost about $1.4 million and use $730,000 from the U.S. Maritime Administration, and other funding, including a pending grant from the Allegheny County Health Department. “Our project is the first inland waterway diesel-powered conversion to natural gas,” she said. Pending approval from the U.S. Coast Guard, the retrofit design — a dual-fuel system that would decrease up to 60 percent of the Principio’s diesel usage — could be a model for other diesel towboats, Ms. Clipper and the team hope.. Between 2,000 and 4,000 inland towboats operate in the U.S. The exact number is unclear. In the Pittsburgh region there are 261 boats, which moved 26.4 million tons of coal, gravel and other commodities on the three rivers in 2015. While some ocean ships — as well as inland boats in other countries — are already operating on natural gas, that’s not the case in the U.S.
All inland towboats in the U.S. operate using diesel engines. While the U.S. Environmental Protection Agency has been working since the 1990s to clean up diesel emissions from various types of vehicles, those regulations apply only to newly built engines. EPA finalized rules for towboat engines in 2008. However, according to 2010 Army Corps of Engineers statistics, 85 percent of the area towboats predate 2004. 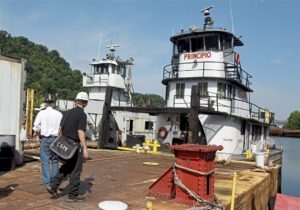 “The towboats run the dirtiest fuel there is in the area,” said Richard Price, executive director of Pittsburgh Region Clean Cities. Controlling those emissions is important because diesel emissions create a toxic soup of asthma-inducing ground-level ozone and tiny particles that get lodged in the lungs, travel to the bloodstream and cause significant public health problems. Diesel emissions also contribute to corrosive acid rain. According to the Port of Pittsburgh Commission, small operators like Gulf Materials, plus the larger companies, add up to 76 regional operators. A 2015 commission report found that the largest of the vessels uses 626,000 gallons of diesel fuel annually. “That is a pretty significant amount of fuel, and amount of particulate matter,” said Tom Risley, director of energy programs at LifeCycle Engineering, the firm handling the project. Mr. Risley began his career as a towboat engineer and is now a consultant for the U.S. Navy. Liquefied natural gas, with a simpler chemistry of just methane molecules, will burn cleaner than the complex hydrocarbon molecules that comprise diesel fuel. In 2010, she found that diesel towboat traffic in Allegheny County emitted 23 tons of tiny particulate matter smaller than 2.5 microns, known as PM 2.5, that year. To compare for scale, the Allegheny County Health Department recorded that all point sources in the county emitted a total of 1,026 tons of PM 2.5 in 2010. These fine breathable particles are smaller than the diameter of a human hair. It is unclear how much of a public health benefit the retrofit of one towboat will be. Mr. Risley’s team will study emissions from the Principio for one year once the project is complete. The grant does not have a definitive timeline. Coast Guard approval of the natural gas design is the main obstacle, he said, as natural gas and diesel have differing densities and energy capabilities, making storage and buoyancy a challenge. He also said the approval process is a contributing factor to the project’s cost. Ashley Murray: [email protected], or on Twitter @Ashley__Murray.